* Seizures are abnormal movements and behaviors that are due to some unusual electrical activity in the brain. 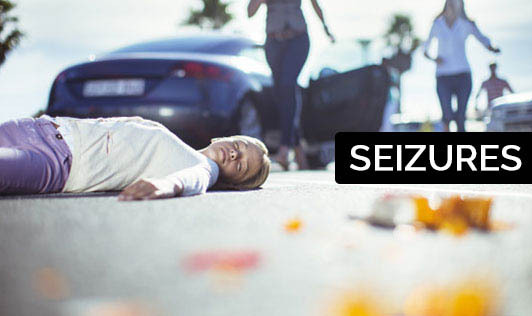 * Seizures are a symptom of epilepsy but not everyone who has seizures has epilepsy. There are different kinds of seizures that include non-epileptic seizures, provoked seizures and seizure disorder. * Non-epileptic seizures are not associated with abnormal brain activity but could be because of psychological issues and stress. * This type of seizure can be treated with psychiatric work. Provoked seizures are seizures that occur because of a trauma, low blood sugar, low sodium, alcohol or drug abuse or a high fever. * Seizures that are fever related can occur in children from infancy to age six. Seizure disorders are a condition where the seizures may be a symptom. * Generalized seizures involve all areas of the brain and are often referred to as grand mal seizures. * Partialseizures or focal seizures are when only part of the brain is involved and only part of the body is affected. * The symptoms of these types of seizures may vary. * Petit mal seizures are common in childhood and are generally brief. Epilepsy is a term that is used to describe the tendency to have seizures. * It is usually diagnosed after a person has had more than one occurrence of a seizure. * The causes of epilepsy usually come from some kind of injury to the brain. * For a lot of people, the cause of their epilepsy is not known. * Seizures occur when there is a burst of impulses in the brain that get out of their normal boundaries. * They then spread around to other areas and make an uncontrolled series of electrical activity. * The impulses can be sent to the muscles, which causes the twitching and convulsions. * There are about 180,000 cases of epilepsy reported each year and about thirty percent of those cases are with children.